Before our politicians risk injury patting themselves on the back for all they've done to stem bullying and school violence, perhaps - just perhaps - they should take a long, hard look at this video. 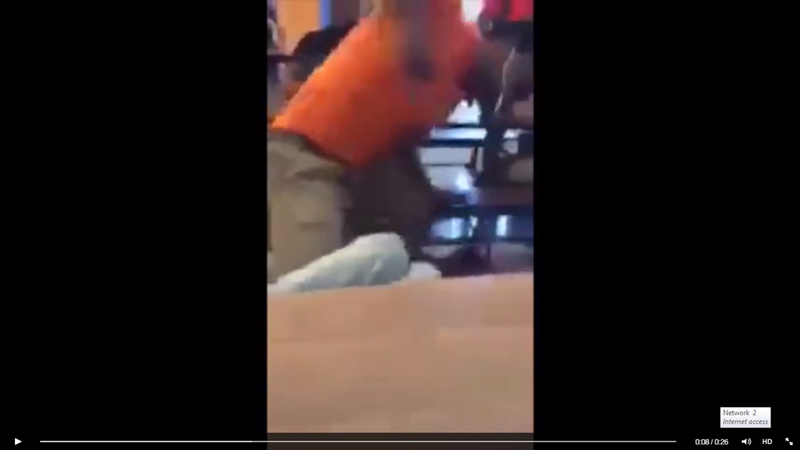 Yes, the one showing how one high school student mercilessly pummeled another, defenseless, much smaller student into a bloody pulp for over a minute ... with no school official to be seen or doing anything to intevene. And yes, at the end of the video you can see the victim having convulsions, for which he is apparently still hospitalized, several days later. To be clear, I'm not saying that the school is completely at fault for this incident; but I am saying that they bear some responsibility for it. (1) At the risk of stating the obvious, the assaulting student has huge anger management issues - and that isn't the school's fault. But I'd be shocked if the school didn't know about these issues beforehand; It's kind of hard to believe this would be the first time this issue has cropped up at school for this student. And, from what transpired, it doesn't seem like the school did ANYTHING about it. (2) Of course, if the school actually had no idea about this student's anger/violence issues, that raises a different issue as to what on earth they are doing to assess the issues their students may have. (3) Either way, the school, acting in the role of parent for these students during school hours, has a responsibility to make sure it's doing its part to assure the safety of its students against such violent behavior - just as we would do during non-school hours. And yes, the mere fact that such an incident can occur for such a prolonged time with no school personnel to be seen among so many teens is profoundly troubling. Post a Comment to "No; Anti-Bullying Campaigns Aren't Working. And Here's Proof"